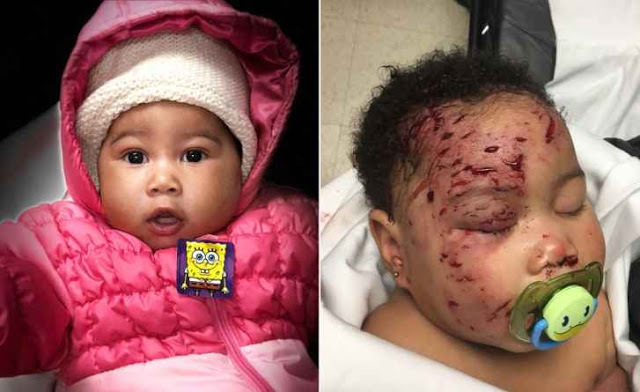 Parents of a 4-month-old girl says their child was left with horrific gashes across her face after she was attacked by a raccoon inside their Philadelphia home. The baby, who was in a bedroom, had been put down for bed. Rodgers said when she got into the room her daughter, Journi Black, was on the floor covered in blood.“I went to take my son to the bathroom. We heard a sound upstairs and we see a raccoon run down the steps,” she said. According to CBS, Rodgers had moved into the home a few days before the attack. The landlord reportedly rents out rooms in the house. Journi was rushed to St. Christopher’s Hospital where she received 64 stitches during surgery. The infant also had to get a rabies shot and is said to be in fair condition. Rodgers said she won’t be returning to the home and plans to take legal action. And now, a GoFundMe page set up to help the family of 4-month old Journi Black has netted nearly $15,000 in just two days — crushing the original fundraising goal of $2,000,aimed at assisting Journi’s family in finding a home to rent.